I heard from lots of you about last week’s blog on celebrating Unprocessed Food month and it sounds like many of you are taking it to heart and really trying to cut down or cut out processed foods. Great job, everyone! Don’t throw your money away by wastingfood! So I thought this week, it may be helpful for you to explore how to save money by reducing the waste in your house. If you are observing Unproccesssed Food month, then you may find your refrigerator full of lots of whole, raw foods. And we all know, those things don’t last forever and if you don’t get to them quickly you will be faced with a furry creature from the black lagoon in your refrigerator containers! We’ve all thought, “Gosh, what a waste” as we are throwing out food which has gone bad. But have you ever taken it a step further and thought, “Gosh, I’m throwing away $2.99” as you are throwing out the soft, squishy, black spotted tomatoes? Putting a dollar amount on what you’re tossing helps give you a visual of your waste. One blogger even suggested keeping track of the dollar amount which you are tossing in the trash and then putting that money in a jar. After 30 days, take a look at the jar to really see how much you are wasting. I think this would be terrific thing to do with kids to help them wrap their minds around waste! 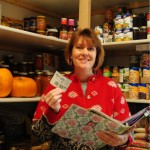 Keep an inventory of the food in your fridge to reducewaste. Menu planning is the #1 tool in fighting waste in your house. By planning your meals out, you then buy and use exactly what you need with very little waste. Be sure to plan the entire meal (main dish, side and dessert), this will force you to use those items which are very perishable in your icebox. As you plan your weekly meals, you can incorporate one night’s dinner into another night’s. I like to make extra rice and then use it one night for asian food, the next night some Mexican rice and beans followed by finally throwing the rest into a warm pot of chicken soup. Keep an inventory of what’s in the fridge! If yours is anything like mine, then things tend to disappear in the back or on the bottom shelf. But if you keep track of what’s in there and make a plan to use it during the week, then you avoid wasting it. I really like the clear glass or plastic containers because you can actually see what’s in them! Leftovers. I know, it can be a dirty word! But honestly, leftovers will save you mega cash! Instead of buying and preparing lunches, just use your leftovers for lunch. I know it seems like a no-brainer but lots of us overlook the value of leftovers! When it comes to using them for dinner again, be creative and plan to use leftovers in a new way so that your family won’t go on strike after the third night of Tuna fish casserole! Cook according to how many people you’re serving. If you are cooking dinner for your family of four, there really isn’t a need to bake a dozen baked potatoes. Now, I’ll admit that my husband and I love cooking in large quantities but I’ve started to pare it down and cook just for the 5 of us. It’s nice to only have a few leftovers or none at all when I prepare accordingly. This saves a lot of waste. Also, I dish up our plates based on how much each of the boys can eat. I know that my oldest will eat an entire pork chop while my middle son will only eat a half but he’ll take 2 pounds of mashed potatoes! Teaching kids to take what they can eat at first is an important habit we’re trying to instill in our boys. It kills me when they pile their plate so high yet can’t finish even half of it. Teaching them this helps them become more aware of waste and politeness…but mostly waste. Compost or livestock. We have a bucket under our sink and when we do encounter spoiled food or scraps on a plate we scrape them into our compost bucket. This either gets incorporated into our compost pile or fed to the chickens and/or pigs (depending on what’s in there). This waste then produces rich soil, eggs, and/or bacon! I’m okay with that! This is a very condensed list of different ways we can save money by reducing our waste. Hopefully, you can stretch your grocery budget even further this month by not only making more home-made, fresh food but also using it in a resourceful way so that you aren’t scraping dollars and cents off your plate right into the garbage! What ways do you reduce waste in the kitchen?